Apple has released a new iPhone campaign to combat Samsung’s new Galaxy S4 handset, touting the flagship features that have made iPhones the top choice among millions of customers worldwide. 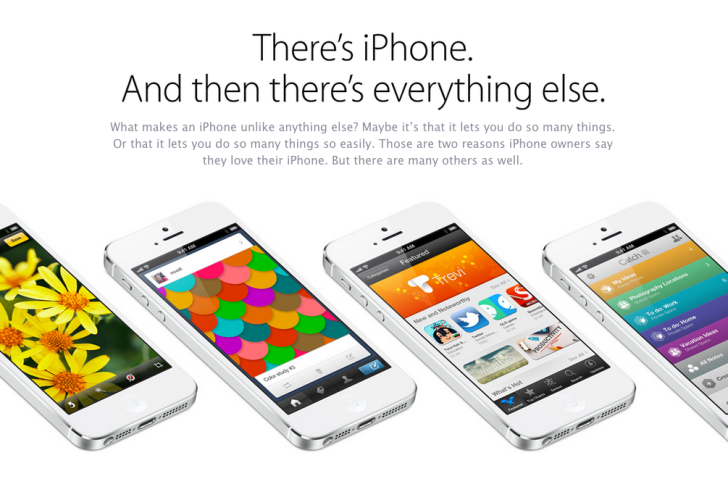 “What makes an iPhone unlike anything else? Maybe it’s that it lets you do so many things. Or that it lets you do so many things so easily. Those are two reasons iPhone owners say they love their iPhone. But there are many others as well,” reads the advert. Apple proceeds to mention that its iPhones have received eight straight J.D. Power and Associates awards for customer satisfaction, as well as the attractive design which also makes the phone thin and light. The Cupertino giant then touts: the Retina display; battery life; the powerful yet power-efficient A6 chip; ultrafast wireless; the cameras; the 800,000 apps on iTunes; iOS 6; Siri; iCloud; and support from real people. Visit Apple’s site to check out the new campaign in full.